JJTV #69 - Nook's Promotion Strategy: The Best or Worst EVER??? In this episode, I debate whether Barnes & Noble's promotion and distribution strategy for their e-Reader - the Nook - was the best OR worst EVER. Whilst I'm not sure about the limited supply portion, the in-store promotion via pop-up retail kiosks was sheer genius. ...and I did purchase Nook's for all the crayon employees, so I guess something's working. My good buddy, Mitch Joel, and my new colleague, Powered's CMO, Aaron Strout, "sat down" to debate whether the industry needs a dedicated social media agency or alternatively, whether digital agencies are best suited/positioned to deliver on social as just another element of an expanding digital toolbox. The seed for this was an Adweek article. Clearly, both Mitch and I have our own unique biases. He works for a digital agency and I work for a social media agency. That said, Mitch and I both felt that there isn't enough productive debate (read: disagreement) in the industry right now and so we came to "blows" in the name of conversation. We're both secure enough in terms of who we are and what we bring to the table to do this and most importantly, we're both GOOD friends and we respect each other deeply. ...that said, you wouldn't know it at times as things get quite heated. At the end of the day, the result is probably a hard fought out draw and hopefully the real winner is the listener and the industry in general. Shmuly Tennenhaus, the man behind the Obamica and the John McKippah (scroll down) is at it again! This time in response to an incident which just occured involving a young Orthodox Jew who was praying on a plane (doing the ritualistic morning prayer involving "Teffilin" (a set of small cubic leather boxes painted black, containing scrolls of parchment inscribed with verses from the Torah, with leather straps dyed black on one side, and worn by observant Jewish men during weekday morning prayers) and ended up being diverted by a panicked flight crew, surrounded by FBI and taking into custody...but later released. So much for religious freedom, 'eh? He put together this video which gets really good around the 2 minute mark. Personally I can't wait for his how-to perform a Jewish ritualistic circumcision using a box-cutter. Cheeky! Shmuly understands "viral"; I've often spoken about a luck factor associated with getting noticed, but cite South African golfer, Gary Player who is quoted as saying, "the more I practice, the luckier I get". Well, Shmuly gets lucky more often than most and his hit:miss ratio is higher than most. Why? I guess you'll just have to ask him...or read on. Note to TSA: you'll probably want to scan the Tefillin next time, but just be thankful that they don't come sewn to the insides of someone's underpants. Change of plan....I'm going to honor all bids of $10,000 or more. And I'm going to extend this until end of day Friday. So if you'd like a Jaffe keynote at a steal and in the process, be able to contribute to more than a worthy cause, contact me via comment, tweet, Direct Message, e-mail [jaffe at powered dot com] or cell and I'll lock in you. Remember that 100% of the proceeds will go towards helping Haiti recover from the horrific earthquake. Think I'll cap this at 5 speeches. Right now I have 2 confirmed. That's $20,000 to the Red Cross to help with Haiti earthquake relief. So essentially 3 more opportunities to be enlightened, challenged and motivated...whilst at the same time making a difference. To me, that's a win-win. Step up people. Step up. Perhaps this episode should have been called deja vu. Come on people....there's more to conversation than reach and CPM's! I passed through La Guardia airport a week ago and saw this billboard featuring their spokesperson, Tiger Woods. Except for the fact, Accenture had turned their back on their cash cow celebrity endorser following his multiple transgressions. The headline of the billboard was even more ironic, "it's what you do next that counts." Indeed. When I saw this, I immediately tweeted about it, recorded and released a JaffeJuiceTV episode, and then on Sunday's Beancast, I noted that Accenture was replacing Tiger with an elephant. Coincidence? I think not. 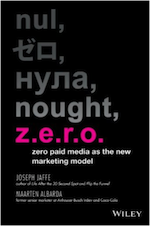 I think someone at Accenture and/or their agencies reads Jaffe Juice. In fact, I know they do. Either way, an elephant never forgets. And neither will Accenture's customers. Nor me. It's probably testiment only good things, but I've been too busy to focus on the acquisition/roll-up announcement since the day it happened. I still haven't gotten around to telling about 90% of the people I'd like to tell...including family members! I've had to fend off several friends and family members who snarled the following words: "...this I had to find out from a BLOG???!!!!!!!" Shortly after everything got announced, all of Powered's NEW executive team from crayon, Drillteam, StepChange and of course Powered, were locked into planning sessions which spanned Monday and Tuesday. News coverage was pretty encouraging. We pretty much got coverage from every major marketing/media outlet (thank you Agency Spy for this rotten photo of me at CES last year 50 pounds heavier and clearly inebriated), with the exception of Ad Age (I live in hope...) We also got a mention in the New York Times. Twitter coverage (as you can imagine) was extensive. On a personal note (and as someone who once launched a company called crayon), I found that there was considerably less hype from the fishbowl this time round. Normally you'll see these kinds of blog posts with pages upon pages of "congrats" from social media cronies in blind support. This time it appears that people really get how significant this move may prove to be....and so there was either genuine encouragement or badly veiled bitterness. Either way, it's all good. We did however get time to do an episode of Jaffe Juice - the New Marketing Podcast and you can listen to the raw MP3 here or the slightly branded one here (as in with JJ bumpers). Mobile Becomes the First Screen by JOSEPH JAFFE, Chief Interruptor Powered, Inc.
Facebook Connect by AARON STROUT, Chief Marketing Officer Powered, Inc. Branded Online Communities by AARON STROUT, Chief Marketing Officer Powered, Inc.
Rise of Customer Service as THE Strategic Differentiator by JOSEPH JAFFE, Chief Interruptor Powered, Inc.
You can download the entire document for free right here. I then headed to Fort Worth to present to the amazing folks at Southwest Airlines. I met Christi Day who runs their Twitter account, @southwestair. In fact, just that day, they announced 1 million followers, which is a pretty significant number in terms of being able to acknowledge, dialogue, incent and activate on a daily basis (hint: Flip the Funnel) I also met their CMO and CEO. Southwest - through Herb Kelleher - is definitely one of the brands which has helped guide, mould and inspire me to be a better marketer. And now I'm back for a few days, but gearing up to officially launch my new book, "Flip the Funnel" (which you'll notice I *still* have not promoted or mentioned in any standalone capacity) at MarketingSherpa's e-mail conference in Miami. Which brings me back to "Flip the Funnel". Schedule allowing, I'm going to write a complete post on the new book this week. It's officially out (as in, in stores) around February 8th, so there's still time to share with you some thoughts, insights and high level vision behind the book. In a nutshell, I've been overwhelmed with how positively this book has been received by/from marketers. It's NOT a social media book, nor a digital book per se....in fact it's a far cry (thankfully) from all the books telling you to get on Twitter and the like. The book takes me back to my marketing roots and if I can get Philip Kotler to tell me he's proud of me, I'll be a happy camper. So now it's off to upload the latest episodes of Jaffe Juice TV and then get back to my keynote at MarketingSherpa's e-mail conference. PS Don't forget that I'm auctioning off a keynote presentation with 100% of the proceeds going to Haiti Earthquake relief. Current bidding is at $10,000 and I can tell you that it's still pretty significantly under my rate card. Find more here. I wonder if there will be any backlash against Accenture for pulling their sponsorship of Tiger Woods. It shows how fickle and spineless this brand really is....with you during the good times; first to bolt when things get hairy.